College Students, What Salary Do You ACTUALLY Need? While that’s not a bad thing in and of itself, it is bad when it leads students to take jobs they aren’t excited about purely in pursuit of higher salaries. Freed from that obsession, they could go after the kinds of work that they’re more interested in, but so long as they’re stuck in the more = better mindset they’ll keep mainlining Adderall hoping to be accepted by the cool kids of post-grad life. There are a few problems that lead to this obsession. Parents have a bad habit of scaring their children into believing they need to make as much as possible (especially Asian and Indian parents, don’t give me that look, you know it’s true). These first two problems are categorically bad. If your parents want you to “make as much money as possible” at the expense of your happiness and interests (beyond a baseline comfort level, of course), that’s their own insecurity and fear of the world being projected onto you. Competing with your peers is bad since it can make you miserable and pursue things you don’t want, but it’s also bad because when you focus on competing just on salary, you miss out on other ways to win (like setting your own schedule, and not checking email for days at a time). But, the third problem that leads to the perceived need to “make as much as possible” is that you never did the math. I’ve discussed this before in my Runway Calculator and Savable Income articles but money does not have a fixed value. One U.S. dollar is a very different thing in New York, Austin, and Medellin Colombia. What you can get for $10 in Medellin would probably be $20 in Austin and $30 in NYC. For some things, like rent, it’s even crazier (think $500 = $1,500 = $4,000). This is why a job that pays $65,000 in Austin leaves you better off than a job that pays you $80,000 in NYC. If you simply used the “I need to make as much as possible” approach, you’d end up worse off because you missed the other factors that contribute to your savable income, like cost of living, taxes, or the likelihood of winding up blacked out on the Brooklyn bridge at 4am on a Sunday. So, instead of saying “I need to make as much as possible,” use the guide below to figure out how much you actually need to make. By doing the exercise, you’ll realize that you don’t need nearly as much as you think you do, and that there are tons of jobs available to you that would meet your criteria. 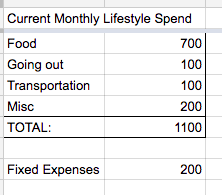 First, make a spreadsheet (you can copy mine here) so you can figure out what you’re spending right now. Replace my numbers with estimates of what you spend on food, going out, entertainment, things like that. Those are your “lifestyle” expenses, and they’ll be necessary for the coming steps. Also, add any fixed monthly expenses you’ll have like student loans. Next, figure out what city or cities you might want to be in, and roughly how much rent would be there. If you’re not sure about rent, go on Apartments.com or ask a friend who lives there. Keep them all in the spreadsheet, and add a new line for each city you’re considering. To get your CLM, compare your current city to the city you’re looking at using this tool (it’s not perfect, but it’s a start). Then, you can multiply that CLM by your current lifestyle costs from Step 1 to get what your new monthly spend would be, roughly, be in your target cities. Now that you have your rent, lifestyle expenses, and fixed expenses, you have an idea of how much it would cost to live in each city that you’re thinking about. Now, all you need to do is take those numbers from Step 2, add them together, divide them by your tax amount, multiply them by 12, and you’ll get what minimum income level you need in that city to sustain that goal lifestyle (the spreadsheet can also do this for you). If it’s scary high, well, you’ll have to cut back in some areas like rent or going out. Or, you’ll have to make more money. But you might also find that it’s lower than you anticipated and that you have more flexibility than you expected with the kinds of jobs you could take.